One of the great joys of returning to Laramie is being able to meet up with Korean families and individuals who have been transplanted in Laramie either for school, work or some combination of both. One such family is composed of a husband and wife and their two darling girls. The husband is an exchange professor in the University of Wyoming Law School and kindly and fortunately, brought his sweet family with him. Thanks to Melissa's work with the school districts ELL families, she had the pleasure of meeting them early in the fall semester and now even has the great pleasure of working with the two girls one-to-two times a week at the University Lab School. The family has helped the Harringtons to settle into American life while keeping up with Korean pop culture, pop music and most importantly food. 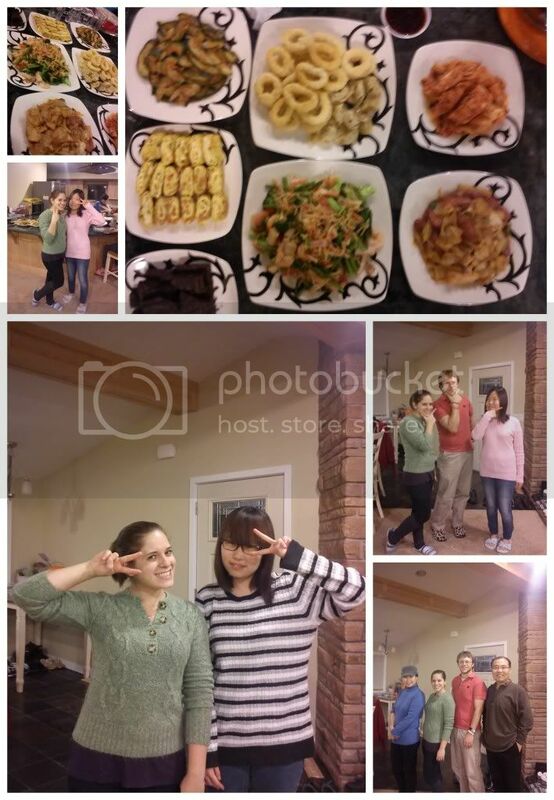 In November, the family came over and helped Melissa prepare kimchi and made a promise to get together soon so that Melissa could learn, first hand how to make a favorite Korean dish, Japchae! The lesson involved learning which spices are most essential (such as pork, dash-i-da, and of course vegetables) and how to test to make sure the noodles are ready. Not only did Melissa learn the fine art of preparing Japchae, but they Harringtons were also served a meal full of all that is Korean deliciousness from calamari to kimchi, to dumplings and cucumber kimchi and so, so much more. To top off the evening, the girls performed some K-pop dances and left us clapping, smiling and remembering all the reasons we love South Korea and all the reasons we're thankful to have met this lovely family!